Subscriptions are replacing the traditional product sales models, and are fundamentally changing the face of businesses, industries, and the job of the CFO in the process. I should know because I’ve gone through this transformation myself. CFOs long-accustomed to product-centric, single-purchase transaction businesses need to get smart on the shift to businesses built around long-term recurring revenue relationships that are becoming the hallmark of the 21st century. The Subscription Economy is becoming pervasive for a variety of reasons. Customers are demanding a more flexible consumption model. General Managers have the flexibility to test pricing and bring new functionality to consumers at an accelerated pace. Executives are realizing this allows for a longer lasting relationship with their customers. And investors recognize that, if executed well, Subscription Economy companies have fantastic revenue and return models. As a finance professional, if you haven’t already participated in the shift to subscription, you need to know that you will soon. When you do, you need to be aware of a critical difference: finance as you know it is broken. Double-entry bookkeeping – the cornerstone of accounting for 500 years – cannot capture the dynamic, ongoing revenue relationships that are the foundation for the subscription business model. You need to value one-time revenue very differently than recurring revenue. You need to measure your business across multiple dimensions of time – not just the past, but the future as well. You need to manage complex changes that can create chaos in downstream processes, such as mid-month subscription cancellations that can result in credits or refunds thereby impacting revenue recognition. As a result, the shift to the Subscription Economy can wreak havoc on finance departments that are not prepared to handle recurring revenue. Why? Because every accounting system in existence today – including ERP – was built around the rules of double-entry bookkeeping. That means your accounting system is still great as a general ledger, but nothing more than that. CFOs and their teams are in pain because it takes longer for them to close the books. My revenue team, like many, was drowning in spreadsheets with a row for every customer – spreading revenue across a multitude of columns. I know this has forced some CFOs to maintain one set of GAAP books to please auditors and another to run their business. On the executive side, CEO and board members demand insights into more than just balance sheets and income statements; they need insights into forward looking metrics, like ARR, Churn, and ACV. I don’t know about you, but at Zuora we have to rely more and more on non-GAAP off-balance sheet accounts to explain our success. In addition, despite a growing awareness of these recurring revenue models many Wall Street investors don’t fully understand the subscription business model and often fail to value subscription businesses correctly. As I said, I know what it’s like to go through this transformation, and it’s is well worth the work involved if done right. But recognize that making this shift may not be by choice. The Subscription Economy is here to stay, and you need to adapt. Customers from all walks want more control over their relationships with vendors, brands and service providers. With widespread internet access and the proliferation of mobile devices and social networks, more and more customers are taking charge. The customers want you to serve them how, where and when they want. Will your company be ready? At Zuora, every single employee lives and breathes this model. In fact, this guide is complied by some of our brightest finance experts and an excellent starting point for understanding how this unique business model will forever change the world of business and how to adapt, not react, to the evolving role of the finance executive. Read on. This data-driven, research-backed deck curated by Zuora CFO Tyler Sloat provides detailed insight into Zuora's business model and explores how CFOs in the Subscription Economy are preparing for the new revenue standards. Whether you’re two guys in a garage launching a new business or a large enterprise shifting to a recurring model, the Subscription Economy will turn your business on it’s head. Instead of focusing on tracking products shipped to random customers at random intervals, your business strategy must now be focused around offering innovative services that breed long-term relationships. So instead of being about single, discrete sales, the Subscription Economy nets down to monetizing and retaining relationships for a predictable recurring revenue. But you’ll need to change the way you measure your business when you shift from the old world of chasing after each and every dollar to this new world of monetizing relationships. Annual Recurring Revenue, or ARR, is the amount of revenue you expect to repeat. It’s that simple. Note that, this does not include one time revenue, it only includes revenues that recur. And with that said, ARR is different than revenue. 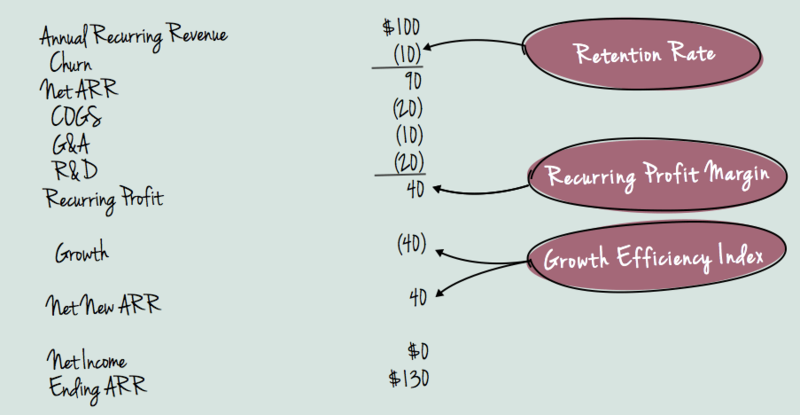 Revenue is a backwards looking number while ARR is a forward looking number — emphasis on “Recurring” in ARR. The Problem? Well, your traditional financial statements is that they only show revenue for a past period and have no concept of recurring, forward looking revenue. But for Subscription Economy companies, because of ARR, they can actually start each fiscal year knowing what their revenues are going to be for that year. In the formula above, we call this Starting ARRn. In it’s simplest sense, churn is the number (often noted in revenue) of subscribers who will not renew. Typically, downsells are also factored into your churn number. It’s a hard reality to swallow, but even if you’ve got the best service offering in the market, you’ll still have customers that leave you. So, in the formula you’ll need to subtract your churn from your ARR for the year. Annual Contract Value (or ACV) is your new revenue brought in by new customers or customers upgrading or renewing their existing contract. You invest in sales and marketing to drive new revenue, because ultimately this increases your ARR. And we like that. If you add up all of these metrics, you not only have a complete financial picture of your subscription business, but you also have your recurring revenue for next year or you’re Ending ARR. Subscriptions are fundamentally changing the face of businesses, industries, and your finance job. So, by now you get the subscription business model. ARRn – Churn + ACV = ARRn+1, right? But how do the ERP financial systems you have in place today support a new model based on fostering and monetizing relationships? But tracking recurring revenue is a forward-looking process. So, when it comes to tracking metrics for subscription businesses, traditional systems just can’t account for the whole picture. Sure, financial metrics like bookings, billings, cash and revenue were tracked in the old world of commerce, but they were backwards-looking and focused on one-time transactions. Let’s look into some of their limitations. Relationships in the Subscription Economy are committed relationships, not one-night stands. Recurring revenue is the output of a committed long-term customer relationship, where both the customer and the vendor hold up their part of the bargain. A committed relationship needs constant attention, whereas a one-time purchase is casual, transactional. Thus, businesses need to account for recurring revenue differently from one-time revenue. But traditional financial systems don’t know how to differentiate between a one-time transaction and a recurring customer relationship, and so they tend to just lump the two together and treat them the same. In the Subscription Economy, relationships will evolve over time. People, customers and businesses — the only thing constant is change. Their needs and their wants will indefinitely constantly change as they mature and as their environments change. Your relationship will have to evolve to service the needs and wants of your customer. This means you need to be able to iterate on your pricing and packaging. And do it quickly — before your customer goes elsewhere. But this can result in quite a burden for the finance team. Every tweak to pricing or bundling can mean an entirely new sku (or stock keeping unit) in your system, or make things real wicked if there are multiple time periods in play. In fact, because traditional finance systems do not know how to spread a series of changing transactions over time, they limit you to simple debits and credits. And if your ‘system’ is a spreadsheet, well good luck tracking the business impact resulting from these changes — things like bookings, billings, cash and revenue – across multiple dimensions of time. Decisions in relationships will have downstream effects. Don’t let yourself think that when a customer decides to cancel their subscription mid-month that it’s as simple as flipping a switch. Complex changes like this can create chaos in downstream processes and will have a direct impact on your revenue recognition. Especially if every notable change the customer makes is managed manually. You need to be able to quickly adapt to changes in the relationship and automatically calculate how this will impact the account, as well as the business. But the core functions of old world financial systems are around tracking raw goods. They are not powerful rule engines. They are not smart enough to adapt to subscription changes in real-time, and re-calculate any schedules impacted by those changes. Limitations can be painful for everyone. Every department in your company will feel the impacts of the limitations offered by traditional finance systems — and this pain ripples far beyond the CFO’s office. The accounting teams struggle to close month-end books on time. Revenue managers are drowning in spreadsheets. CMOs are prevented from implementing new packaging and pricing because of the burden it places on the finance team. CEOs are having a hard time explaining their success to Wall Street. And, last but not least, CFOs are forced to maintain one set of GAAP books to please auditors and another to run their business. Relationships require a new system, a Relationship Business Management system. Throughout this series, you’ll hear over and over again how at the heart of any subscription business are the customer relationships. But in order to really rethink and reinvent how you manage relationships, you need a system that will partner in offering a new subscription experience and a new customer journey, and has an integrated approach across not just subscription finance, but commerce and billing, too. Understand the critical differences in the subscription model and build out operational strategies for success. If you’ve kept up with us, by now you understand the basic subscription business model. You also now understand that when it comes to managing the relationships inherent in subscription businesses, leveraging traditional financial models like gross profit, net margin, and EBITDA is like sticking a square peg into a round hole. The bad news is that now there’s an entirely new set of metrics to keep you up at night. The good news? There’s only three of them. At Zuora, we first look at growth. How much do we want to grow and what will cost the business? Basically, your growth efficiency index, or GEI. After we’ve achieved our GEI, we then move to churn followed by recurring profit margin. And then this becomes a cycle…do we want to invest? Great! This means we can grow at an even faster rate by accepting a higher GEI. Capiche? Lets actually dive deeper in these three metrics, and why they’re so critical to leverage when determining the success of your business. For the sake of making this clear and simple, let’s say you’re a b2b SaaS model and start off the year with a $100. Now, using these 3 metrics, lets trace what happens over the course of the year. As I mentioned earlier, we start by asking ourselves “How much new recurring revenue can we get out of a given investment?” Lets say you spend $1 on sales and marketing. How many new recurring revenue dollars does that buy you? This is your Growth Efficiency index. Another question you’ll ask — “How much of our recurring revenue should we invest in growth?” If you’re smart, you know that at a minimum, you’re going to spend at least enough money to replace the customers churned. In this case, $10. Which leaves you with $30. Do we take the $30 off the table and book as profits? A 30% annual profit margin isn’t bad. Then again, we won’t see any growth. Instead, let’s be bullish and invest all $30 in growth. With a Growth Efficiency rate of 1:1 you’ll book $30 in net new recurring revenue over the course of the year, leaving us with $130 in Annual Recurring Revenue to the next year. If you run this play year over year, you’re growing by 30% annually. But with an infusion in capital, you’ll have more than $30 to invest in fueling that growth, as long as you maintain an efficient Growth Efficiency ratio. When the time comes to finally start taking profits, you’re working off of a much bigger recurring revenue stream. As we’ve said before, no matter how amazing your offering is, it’s inevitable that you’ll lose a certain percentage of your customers. Drivers of churn could be things like business failure, competitive loss or even customer downsells. But on a positive note, churn rate can tell you a lot. Right away, churn is deducted from your ARR. Because I’m in favor of easy math, let’s assume 10%. That leaves us with a net ARR of $90. Now that you know how your churn rate will affect your starting ARR, it’s now clear the minimum amount of new business you’ll need to acquire this year in order to keep your company viable. You will also see here the interconnectivity between GEI and Churn. If your GEI is 2:1 (i.e. you spend $2 to generate $1 of ACV), and your churn rate is 30%, you will be losing that 30% of your business well before you recover the 2 years of ACV it cost to acquire them, Clearly, this is critical. Recurring Profit Margins are simply the difference between your recurring revenues and your recurring costs. Leveraging this metric is critical. Why? The higher the recurring costs, the less money you have to play with — aka, book as profits or invest in one-time growth expenses. Let’s put it to use, in our example. You’ve now got $90 to play with. But there’s some natural, recurring business costs that will eat away at that number pretty quickly. You’re going to spend money to deliver your service so that you can earn the recurring revenue you’ll need to grow your business, aka COGS (Cost of Goods Sold). For a SaaS company, an example of a COGS would be the cost to maintain your data center. Let’s say you spend $20 here. There’s also, General and Administrative (G&A) costs just to keep the lights on — literally. Things like rent for your office space and paying your finance team. Let’s say you spend $10 here. And what about Research & Development (R&D). Not typically a recurring cost, but we’ve seen that most companies’ R&D organizations don’t fluctuate wildly over time, unlike departments like Marketing. Let’s budget $20 for your recurring R&D. I’m sure you’re already ahead of me in the calculations, but these recurring costs have left you with $40, or a 40% recurring profit margin. And then the cycle begins again — now you know how much you can invest back in growth or book in profits for the year. Now that you understand the subscription business model, the need for a new system to support this model and the metrics required to deem success or not, now let’s send you off with a handful of strategies to set your subscription business up from for rapid growth and scale. In the final chapter, I’d like to pull out the key strategies we’ve highlighted throughout this 101 series — sort of a one-pager roadmap on how to thrive in the Subscription Economy. All companies focused on growth have a goal of acquiring new customers. But for subscription businesses, you’ll also strive to establish valuable, meaningful relationships with your customers to increase their value and to retain them over time to minimize churn. One strategy for increasing the value of your customers is implementing a pricing framework offering various editions. This means, a customer can easily move to a higher edition as their needs increase. Alternatively, a customer can move to a lower edition if their needs decrease. Initially, the latter scenario sounds negative. But just think — if you didn’t have that lower edition as an option you risk losing the customer all together. Whereas just moving down a tier, means you retain the customer — aka, at least some revenue. Traditional finance statements are really only good for the product economy. Why? Because they are backwards looking — anchored on a revenue number for a period of time that already occurred. Whereas, subscription businesses need to align themselves and drive growth by maximizing recurring revenue. Sometimes this is called monthly recurring revenue (MRR), annual recurring revenue (ARR), and sometimes quarterly recurring revenue (QRR). Regardless of which you choose, in order to optimize for forward looking revenue, aka recurring revenue, you need to be looking at a completely different set of metrics. Churn: Deducting your churn rate from your ARR is critical for understanding the minimum amount of new business you’ll need to acquire this year in order to keep your company viable. Recurring Profit Margins: This is simply the difference between your recurring revenues and your recurring costs — things like COGS or G&A. Leveraging this metric is critical. Why? The higher the recurring costs, the less money you have to play with. Meaning you have the intel to choose to either book as profits or invest in one-time growth expenses. Growth Efficiency ratio: This ratio shows how much new recurring revenue the company earns with a given investment in sales and marketing. In other words, if you invest one dollar in sales and marketing, how much does that one dollar get you in recurring revenue. A common theme throughout this series is how traditional finance systems or ERPs just aren’t built to support the subscription business model. Scenario after scenario of subscription business use cases only validates that running your subscription business on a legacy system is like attempting to stick a square peg in a round hole. Where at the center of a legacy system is a SKU, it really needs to be the relationship. In order to thrive in the Subscription Economy, you need a system that enables you optimize customer relationships. There’s no way around it — Subscription businesses need Relationship Business Management (RBM), not “resource planning.” RBM enables you to quickly change your pricing and packaging to keep up with market needs and competitive moves. RBM is flexible, scalable, and intelligent enough to calculate recurring revenue, churn and forward looking metrics. The subscription model is not only a cost effective, low risk model for customers, but it also provides a huge potential for subscription businesses and investors. Seize the opportunity and leverage these strategies to build and maintain valuable relationships with your customers and ultimately, accelerate your company’s growth.